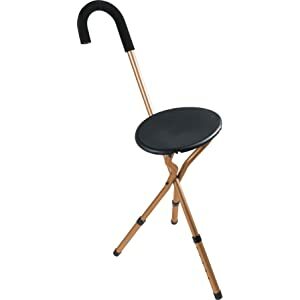 If you’re someone who needs a cane to help get around easily, you know how hard it can be to find a good place to sit. Sometimes things can be too low or too high which can make getting back up difficult. Some seats can also be very uncomfortable to sit in because there are neither pad-added nor has a backing. Because of this, you’ll want to look at using folding cane seats. 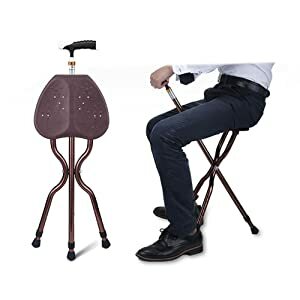 These products are designed to help make it easier for those who use a cane to get around and provide comfort when sitting on. If this sounds like something that could help you, keep reading. You’ll learn some things to look for in one of these recommended products. 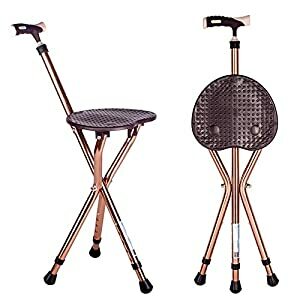 What is a Folding Cane Seat? A folding cane seat is a versatile product that can convert from a cane into a seat. 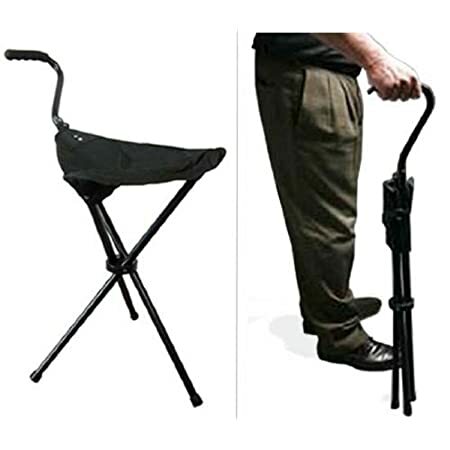 This cane with seat comes in various styles and is designed to help make moving around much easier. There are many benefits that come with using a walking cane with seat. First, they can help you to be more mobile. Because they convert easily into a comfortable seat, you can move and sit practically anywhere. They’re also comfortable and some models sometimes come with a massage seat which can help to prevent backaches and muscle soreness when you sit on it. This is often unlike regular canes which can cause fatigue easily and don’t necessarily protect you from falls. Many can also support large weights, in fact, there is an available 300- lbs-walking-cane to buy. Second, folding cane seats are easy to use. You can fold and unfold it easily in seconds, which can give you more freedom to move around. Third, folding cane seats are also safe to use. They are constructed out of strong materials like aluminium alloy or steel and come with tips on the bottom as a safety feature to help prevent slipping. It is very easy to snap them in place with a small button which will keep everything secure until you’re ready to start moving again. Decide to shop for a folding cane seat, there are a few things you’ll want to keep in mind. Listed below are some of the key aspects to consider before you buy one. While these products need to be sturdy, some are more so than others. Therefore, you’ll want to pay close attention to how secure it will be when you sit on it. The next to consider when shopping for this portable seat is to check its durability. You don’t want to buy a chair that will wear out and break easily. You’ll definitely want to check the warranty of the chair, which should be at least one year, to ensure it works well for your needs. Because you’ll need to transport these items around with you, you’ll need to check how lightweight it is. These chairs should weigh no more than 3 lbs. Otherwise, they will be difficult to carry around instead of being something to help you. Folding cane seats come with various types of seats. Some of the most popular are aluminium and canvas. Aluminium can be a bit sturdier but is a harder surface. Canvas, on the other hand, is softer but doesn’t give much support. Due to the many different options available, you’ll want to pay attention to the type of seat to make sure it’s comfortable for you to sit on. Another thing to consider before buying one of these products is their colors. You shouldn’t settle for generic colors that don’t match your tastes. Many chairs often come in unique colors like pink and green so you can find something that will fit perfectly for you. The M-GYG Folding Cane Seat comes in color choices of brown and blue and can hold an astonishing 441 lbs. Made out of a durable aluminum alloy, it is made to be sturdy so there’s no need to worry about it falling or slipping when you sit on it. For extra safety measures, it also has anti-shock slips on the bottom which are covered with rubber tips to ensure the seat stays secure when you unfold it. This product is lightweight so it will be easy to carry around without problems. It features three legs on the bottom and is adjustable so you can move it to your preferred height. This folding cane seat by Drive Medical features strong aluminum pipes and a stylish black design. It’s made with three legs to help support your body well when you sit on it. On the bottom of these legs are rubber tips designed to help prevent the seat from slipping or falling over. Its seat is made with a comfortable material and measures 9 inches across. This seat can hold up to 250 lbs. without problems. This affordable model is ideal for those looking for something reliable to use for their needs. However, you’ll need to make sure to check the seat every now and then to make sure everything is secure. 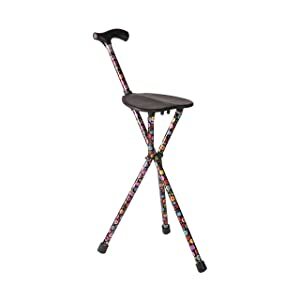 The Drive Medical Adjustable Folding Cane Seat comes in a black color scheme and features a sturdy tripod design meant to help keep your body secure when you sit on it. The 9-inch seat included on it has a circular design and is made with a soft material to ensure it’s comfortable to sit on. This product is made with aluminum tubes which are durable and won’t wear out easily. This seat can hold up to 250 lbs. and weighs about 3 lbs. when folded up. While this isn’t much, it’s a bit heavier compared to other models so if you’re looking for something extremely lightweight this might not be the right model for you. The Switch Sticks Stick Seat is made with a cheerful bubble design and a large handle at the top so you can easily hold on to it when you sit down. Made out of strong aluminum tubing, it is a secure option so you don’t have to worry about it slipping out from under you. It also has rubber tips on the bottom of the legs to help provide extra security. The seat can hold up to 220 lbs. and when folded up weighs only 2 lbs. Keep in mind though that this is a smaller model so if you need a larger seat this might not work well for you. 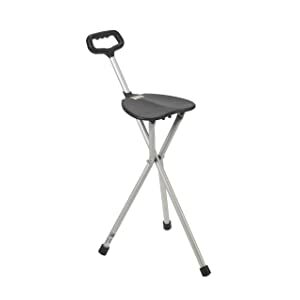 This folding cane seat by NOVA Medical Products is made out of a strong aluminum material that weighs only 2.3 lbs. making this model a very lightweight product to invest in. When unfolded, the seat measures 8 x 10 inches and is easy to fold and unfold so you won’t have to spend a lot of time adjusting it. This durable choice also has tips on the bottom of it to help prevent any possible slippage. It can hold up to 225 lbs. but isn’t necessarily the best choice for walking purposes. So, if you are looking for a model that works well as a cane, this probably isn’t the right choice for you. The YAO RUIRUI Folding Cane Seat is made with a brown design and features a comfortable massage chair seat that can hold up to 250 lbs. 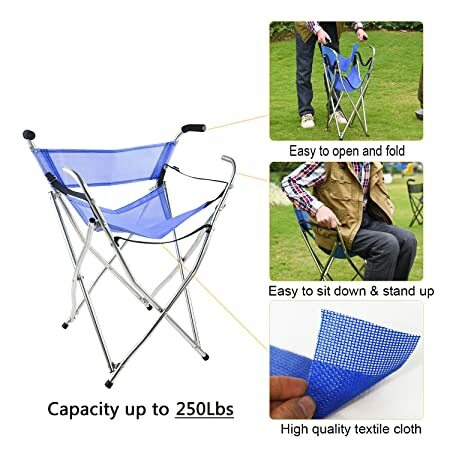 This folding cane seat is very lightweight so there’s need to worry about it being too heavy to transport around. The cane of this product measures 31 inches tall and is made out of an aluminum alloy that helps to keep it durable and non-slip when you walk around with it. You can also adjust the height of the chair and cane with the small buttons on the seat. This product is a little on the pricey side, but it’s very durable. This product by JUVO Travel is made with a gray color scheme and is the perfect model to use for traveling. As it only weighs 2 lbs. 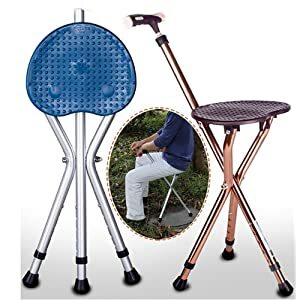 it’s a very lightweight folding cane seat so it won’t be difficult to move around. The seat can be opened up into a tripod design which is made sturdy thanks to the aluminum tubing. 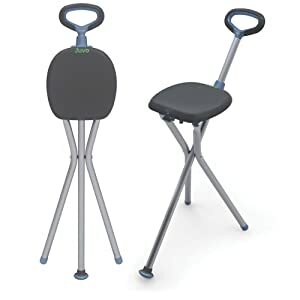 It has a wide 9-inch seat and a large rubber handle on the top you can hold onto when sitting or moving around. This product can hold up to 250 lbs. and comes with rubber tips on the bottom as an added safety feature to ensure it doesn’t slip when you use it. The Canes G&M LED Folding Cane Seat is a unique model to invest in. Not only is it one of the larger folding cane seat models on the market today, but it has a special LED light feature. You can remove the top of the cane where you can insert a light so you can see where you’re going in dimly lit areas. When opened up, this chair will secure itself with its strong aluminum alloy tubes. The tubes have rubber tips on the bottom of them to help keep the chair secure on the floor. After opening it up, you can sit on its massage chair which is designed to be soft so you don’t get backaches. It comes in a soft brown color and comes fully assembled so you can use it immediately. 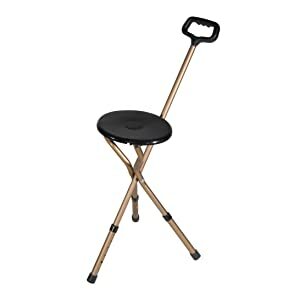 This folding cane seat features a tripod design when opened that is made of a durable steel material. It comes in a black design and features a soft canvas seat when unfolded. The seat can hold up to 250 lbs. and has a rubber handle on the top so you can keep your balance while sitting and get up easily. The seat has safety tips on the bottom of it to help keep it better secure to the floor so you don’t accidentally slip. This model does need some assembly before you can use it and might be a bit heavy to carry around for some. The Freshore Heavy-Duty Folding Cane Seat might be a little pricey, but it’s one of the most durable models on the market today. Designed with a sleek blue color, this seat folds out into a full-size chair, something which many similar products don’t do. It has four stainless steel legs which can help to better secure it to the ground and features rubber tips on the bottom of it to help prevent it from slipping. There is a soft sponge covering handle on the top so holding on to it won’t be difficult or uncomfortable to do. This large chair can hold up to 250 lbs. and measures 33.5 inches tall. Folding cane seats are the perfect way to help give you a quick break without problems. They come in many different types so there are many options that can fit everyone’s needs. The information above will help you to find the best product on the market. Be sure to keep it in mind, as well as the product recommendation, to ensure that you buy the ideal folding cane seat for your needs.